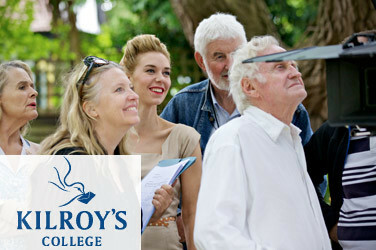 Kilroy’s College has launched a suite of film-making training courses in partnership with the Irish Film School. The Irish Film School was set up in January 2018 by iconic film director John Boorman and leading film producer and financier Kieran Corrigan. They provide professional training courses in filmmaking, film production, visual FX and the business of film. The training courses have been carefully designed by the founders who lead a team of accomplished instructors, including Hollywood legend Roger Corman and Academy Award winning VFX house DNEG. These courses will help students to develop the creative, technical and business filmmaking skills needed for today’s dynamic global film industry. They will also be able to network with fellow students, instructors and industry professionals during each course. These intensive, hands-on classes are taught by the world’s most experienced film and TV professionals. Instructors are fully qualified, active members of the film industry in all fields of filmmaking: directing, producing, screenwriting, visual FX, cinematography, lighting, sound, editing, post-production and more. IFS instructors also work at the business end of the film industry in the domains of finance, legal, tax, insurance, sales and distribution. Kilroy’s College, in partnership with the Irish Film School, will be running five short, intensive training courses in autumn 2018 and spring/summer 2019 in Dublin, London and Beijing. Irish Film School have partnered with leading industry advisory groups: Merlin Films, Great Point Media, DNEG, New Horizons, China Film and Kilroy’s College to ensure that the training programmes deliver the most up-to-date skills and best experience. Class sizes are limited so book your place today to avoid disappointment. All courses are discounted by 20% in an Early Bird Offer – valid until 10th September 2018.